I corrected the post, damn spell check I think, should have read wasn't not was. I thought you were referring to the 3m stuff after the coating was put on. Wow! IMSA, how much to do a set of GT lights? No...still here. I just don't check this thread too often. I've spoken with tshark from the post above via PM. I just don't have the time to do these any more. It got so hectic with my work schedule that the last set I did for a member on here took me about 1 year to finish just because I am rarely home. I just can't take taillights from people on here and keep them for that long not knowing when I will have the time to finish them. I'm going to tacke this project soon but have lenses the prior owner painted over with a flat black paint. What is the best product to remove the already applied paint and not damage the lens? I did some research and found some use acetone and/or nail polish remover but this was done on body panels. Would these still work on the tailight lens and not damage them? Wetsand the lenses with 800 grit to remove the old paint. The lenses will be a hazy white and it will look like you ruined them but don't worry. Then mask off the letters and the actual lens portion. Spray your black basecoat then remove the masking. Then clearcoat the entire lens including the clear portion. The clearcoat will fill in the micro sanding scratches and the lens will become clear again. Then wetsand with 1000 grit and buff the lenses out just like a new paint job on a car. Hey guys, I kinda have a stupid question. What does delaminated tail lights look like ? Are you guys talking about the dull finish ? I have tail lights on an 84 that are on the dull side but also have some spider web effect cracking in then here and there. Will painting them with clear eliminate this spider web look or will it enhance it ? 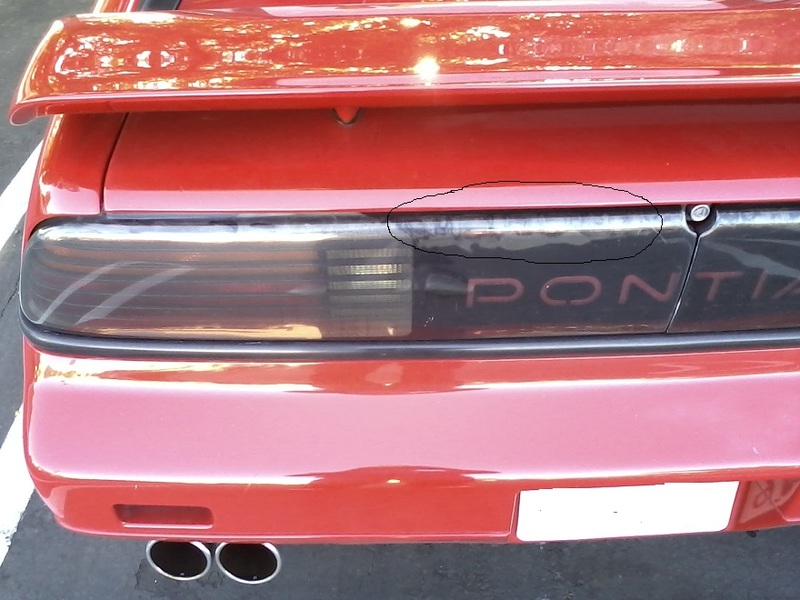 Delamination in this context refers to the GT tail lights where the black piece inside separates from the clear lens and results in the kind of graying out area like the circled area in this pic. Usually the result of sun exposure weakening the bond through UV action or heat. The process described in this thread does not actually repair the damage but covers it from the outside. Notchie tail lights do not have an inner layer to create the same problem. Thanks for the reply RSVL-RIDER. My tail lights have some spider web looking micro cracks in them. Will wet sanding them down, buffing them, and then clearing them with clear urethane freshen them up ? Also thanks for clearing up the delamination for me. It makes sense now. One last question. After the lens is wet sanded and masked is anything used to clean up the residue from the wet sanding ? I was just wondering so the urethane doesn't fish eye or bubble from the lens not being 100% clean. Should it be wiped with paint thinner ? Also when wet sanding should a little dish soap be added to the water or just use water without the soap ? Many thanks in advance. Yes, a bit of Dawn is what I use when wet sanding.